Rebecca Riots - (Terfysg Beca). 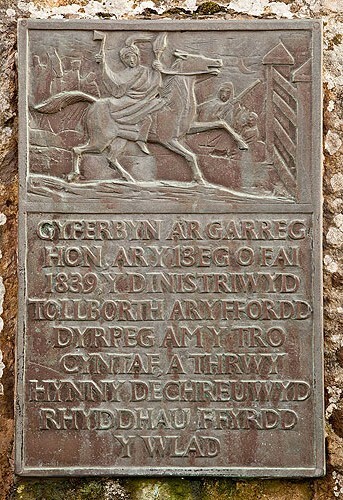 A plaque on the eastern side of the A478 , to the south of Efailwen in Carmarthenshire. Following a period of poverty and rural discontent, there was considerable agitation over the tolls to use the Turnpike Roads. The band tore down and burnt the toll gate erected by the "Whitland Turnpike Trust" on the Cardigan to Narberth road at Efailwen , on the night of 13th May 1839 . The rioters rode about the country on horses , dressed as women , burning down toll gates and the houses of toll keepers . They called themselves 'Rebecca and her Daughters' after a verse in the Bible - Genesis 24:60 - "Rebecca's seed shall possess the gates of those that hate them". Following the Rebecca Riots all Pembrokeshire turnpike roads were taken over in 1845 by the County Roads Board. Opposite this stone on the 13th May 1839 the tollgate on the turnpike road was destroyed for the first time and thus started the freeing of the roads of the land.